Army Pfc. 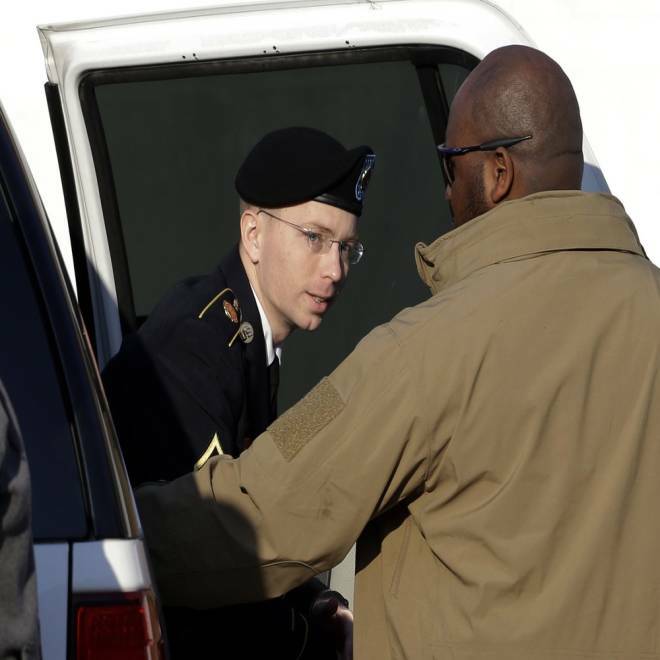 Bradley Manning steps out of a security vehicle as he is escorted into a courthouse in Fort Meade, Md., on Thursday. FORT MEADE, Md. -- Pfc. Bradley Manning spent six more hours on the stand Friday during a hearing on the WikiLeaks case, facing questions from the prosecution, the judge and his own attorney, David Coombs. The discussion never deviated from Manning's treatment while at Quantico brig, focusing mainly on why he didn't complain about his treatment before January and on various incidents that may have led to the military to put Manning on prevention of injury status, which put more restrictions on him. Manning did seem to choke back tears at one point when he spoke about his family. When asked why he never complained about his restrictive status to his family during visits, Manning's voice hitched and his face got red. "I didn't want them to worry about me," he said. He added that he worried that he would not be allowed to have visitors if he complained. One of the Marine guards who was assigned to Manning testified Friday evening about how Manning behaved at Quantico, saying that he was not a disrespectful inmate, with the exception of an incident in January 2011. The guard testified that Manning yelled at the brig commander, which led the guards to call a "code blue" and mobilize a response team to possibly remove Manning forcibly from his cell. In the end, Manning wasn't removed from his cell, but the guard explained just how significant this incident was in the facility. "It was an extremely big deal to show disrespect to the commanding officer of the brig," the former guard said. Judge Denise Lind asked whether it was standard for someone who is disrespectful to the commander to be placed on suicide watch as a result. "It never happened before," the former guard said. Earlier, a prosecutor, U.S. Army Maj. Ashden Fein, read through dozens of weekly evaluations in which Manning said that treatment by his guards was "excellent" and the facility "very professional." Fein also walked through months of assessments in which Manning did not ask to be taken off of protective status (which is essentially one step less restrictive than suicide watch). Despite arriving at Quantico in late July 2010, Manning did not ask to be taken off prevention of injury status until January 2011, the defense said, when he appeared before a board to plead his case for fewer restrictions. The defense argued that Manning demonstrated that he might harm himself on several occasions - including once making a noose. Among the exhibits presented in court Friday were two bedsheets. Manning said that he recognized one of the sheets and, when asked whether it was the sheet he had made a noose out of while in detention in Kuwait, Manning said, "yes, sir." The prosecution asked about Manning's handwritten statement on an admission form at the Quantico brig, in which he responded to a question about any suicidal tendencies with a cryptic "Always planning, never acting." Manning said that when he appeared before the board in January 2011, the focus was on those two incidents. When the board asked about his admission statement, Manning told the court Friday that he had responded that it was really more of a philosophical question, so he gave them a longer, more intellectual answer. Manning said he argued with the board about what is really true or false, and explained that humans are fallible. He said it may have been a "sarcastic answer, given on a whim." Manning did elicit laughter from some people in the courtroom when Fein asked him if he needed a "comfort break." Manning responded that he could wait. "Seven more minutes will be good," he said, adding, "I can control my bladder." The prosecutor said he would try to limit his next few questions to exactly seven minutes.